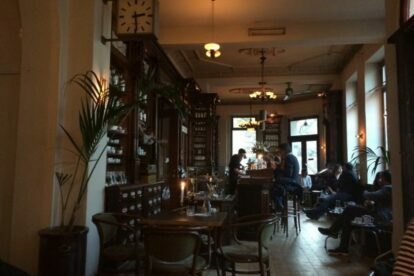 You have to look for these old gems these days in Berlin, those classic-looking cafes that inspire you. ORA popped up as a cafe after serving for years as a pharmacy in the Kreuzberg neighbourhood. I never visited the Oranien Pharmacy. But I must admit I don’t think much has changed. It’s the same, really. Same medicine cabinets, old wooden stairs. Except, instead of cold medicine you can get a nice little booster of a cocktail. They are beautiful and punchy. I have not yet made my way through the whole cocktail menu, but the ones I’ve tried made me very happy, something with beetroot and something with fig juice. Delicious. To be honest that’s all I remember. Because after sipping those delectable concoctions we were talking about the Charleston underneath the warm candlelight, floating in a tipsy, dreamy cloud in the golden twenties, chatting, giggling and drinking water out of a chemistry beaker. Bring a book if you want, or a friend. It doesn’t always have to be so epic. But it is always highly enjoyable. And I hear the breakfasts are pretty great too.